'Tis the season for pumpkin pie! Instead of buying a pre-made boxed product, try your hand at our tasty and healthy pumpkin pie recipe. While preparing this heathy pumpkin pie recipe, remember to save—and bake—those pumpkin seeds. They're known to improve such bone conditions as osteoarthritis and osteoporosis. Although the pumpkin is a very nutritious gourd that provides lots of protein, calcium, and zinc, pumpkin pie is another story. Between its buttered crust and the added cream and sugar, the beloved pumpkin pie can be an unhealthy fall dessert. Luckily, we have a healthy pumpkin pie recipe that has all of the taste but less of the added fat and sugar. So after all of the delicious turkey, cranberry sauce, and sweet potato casserole on your holiday dinner menu, we hope you leave room for this yummy treat. Combine ingredients and press firmly into pie pan. Bake at 350 degrees for 10 to 15 minutes, or until lightly browned. Add filling. One of the joys of DIY pies is going out at harvest time and choosing just the right pumpkin. Click here to read a post called Finding the Best Pumpkins for Pies. *Note: Fresh ingredients are healthier than canned foods due to BPA exposure. To use real pumpkin rather than canned pumpkin, cut one large pumpkin in half. Scrape the inside of the pumpkin to remove the stringy fibers. Place the two halves cut side down in a roasting pan along with 2 cups of water. Bake the pumpkin for 90 minutes. Scoop the inside of the pumpkin out and puree with a blender or food processor. Beat eggs lightly with a whisk. Add all other ingredients and beat until smooth. Bake 15 minutes and then reduce temperature to 350 degrees and bake for another 45 to 60 minutes. Test with toothpick starting at approximately 45 minutes after lowering the oven temperature, and every 5 minutes thereafter. The toothpick should come out clean or nearly clean when the pie is done. For related reading, please visit these posts. Various parts of the pumpkin also have been shown to lower blood pressure, control blood sugar, and improve urinary help. For more information, see our post Pumpkin Health Benefits. add, anticancer, bacteria, benefits of ginger, blood pressure, blood pressure control, blood sugar, bpa, bpa exposure, breast cancer, calcium, cancer, carotenoids, colon cancer, control blood sugar, diet, food, ginger, health, healthy pumpkin pie, healthy pumpkin pie recipe, lower blood pressure, lung cancer, milk, organic, Prostate, prostate cancer, protein, pumpkin pie recipe, recipe, stevia, sugar, to lower blood pressure, types of cancer, vegetables, walnuts, zinc. Hooray! I love that this is so low-carb friendly! A crust made of nuts, who knew? You mean PASTURED eggs–organic eggs are also fed grains–just organic grains, which doesn’t help! Pastured eggs are from chickens who roam around the pasture and eat bugs and plants (what they’re SUPPOSED to eat). What is the measurement on pumpkin? I’m using fresh pumpkin. Thx. What is the # of carbs, protein, fat, etc? thanks! What about nut allergies? Do you have a no-nut healthy recipe? Also allergic to soy, sunflower seeds, sesame seeds and coconut! 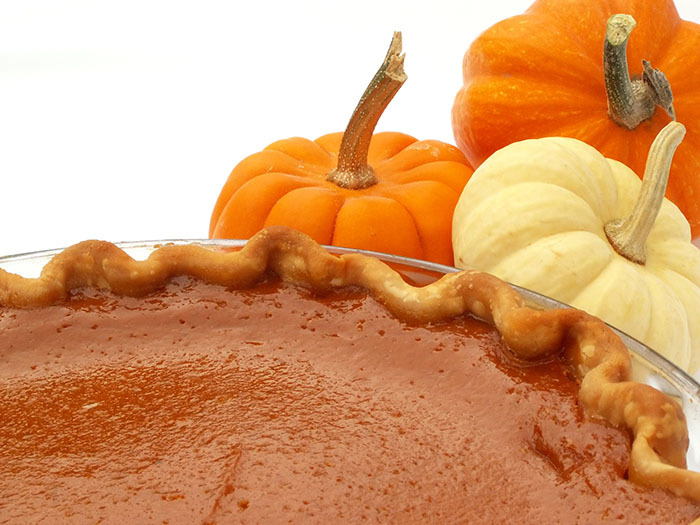 What size of pumpkin cans and pie pan diameter? Does anyone answer these nquestions? I just made this pie but don’t know the amount of grams and size I can have. You can put the ingredients into something loike My Fitness Pal and get the carb count. 1/3 cup stevia? Seems like an awful lot. What form is the stevia in? Liquid? Powder? I can’t imagine that 1/3 cup of a purified stevia extract powder wouldn’t be overpowering, but if it’s been bulked out with something else, then what’s been added matters, and not just because it affects the how much carbohydrate is in finished pie. For example, Trader Joe’s sells a stevia powder that’s bulked out with lactose. Hi, I’m lactose intolerant. Fortunately, Trader Joe’s also has a 100% stevia powder. It’s the stuff in the smaller bottle. I’ve seen at least one stevia product that’s bulked out with dextrose AKA glucose. I think your readers need to know the answer to this question. I calculated the carbs at total: 13.2gm, fiber 7.5gm . just a fyi all chickens are fed grains. even pastured ones. hens would barely lay any eggs and certainly not enough for someone to be selling them. pastured, organic, non-gmo tested, no corn or soy (which would be near impossible to find on the last two points) would give you the best possible outcome outside of raising your own. nevertheless thank you for the recipe I look forward to making it tonight. Okay, it’s been over a year since my last comment and nobody’s responded. Also, I notice that 1/3 cup xylitol can be used in place of the stevia. Now, since stevia is several times sweeter than sugar and xylitol is less sweet than sugar, the obvious conclusion is that the stevia must have something added to give it bulk, but we still don’t know what. 1 can of pumpkin is typically 15 ounces. You would need 30 ounces total of homemade pureed pumpkin. A standard 9-inch pie pan will work. I prefer powdered Stevia because powder binds better than the liquid; however, you can use either liquid or powder form. Many people prefer the taste of birch tree Xylitol over Stevia. The type and amount of sweetener can be adjusted to your taste preference. (You can even use honey or pure maple syrup if you choose.) I personally have found that you need more powdered Stevia than any liquid sweetener to give it the same amount of sweet taste. One word of caution: you do have to be careful when buying powdered Stevia as most brands have additives included.